Here we are at the entrance to my room- you can see my bed/desk to the left, dresser to the right, and my giant ikea shelves in the back corner of the room. The rug is also from ikea- I think it was something like $20, and I love the flower design. The colors in this photo are a little off; the walls are painted in this hazy purple-pink-grey color that I'm obsessed with. It's the same color that I painted my room in my last place and I still love it. Because the room is a little small, I chose to paint all my furniture white so it didn't end up looking like a cave. 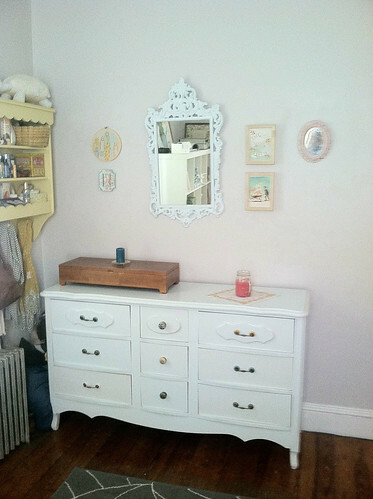 This bureau was picked up off the side of the road a few years back, and was pretty dingy. 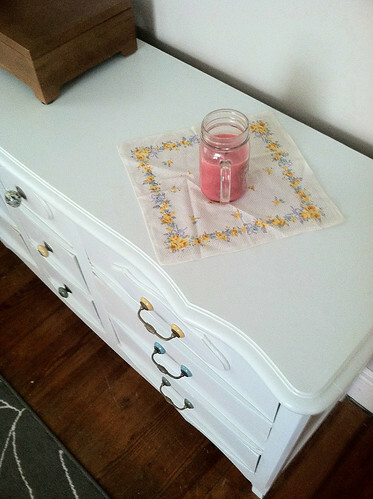 I re-painted it and splurged on some fancy anthropologie drawer pulls, and I love how it looks now. That yellow wall shelf was snagged for $5 at a yard sale in my neighborhood, and I use it to organize my toiletries and knicknacks. My favorites are the hand-stitched stuffed turtle I made for an art installation, a woven totoro reed basket from Bolivia, and a mounted butterfly from a shop in Providence that doesn't exist anymore. I found this vintage hankie at an antique store (looks like it could use a little ironing!). The brown wooden box is a stationery organizer given to me by a friend that I've been using for my jewelry. 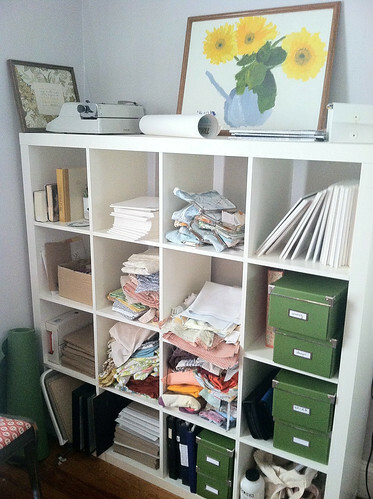 This shelving unit has made it so much easier to organize my art and shop supplies! I keep my fabric, prints, mailing envelopes, sewing supplies, and a bunch of other random things here. On the top I have one of my first paintings (the one of the sunflowers) that I did when I was seven, my beloved cursive typewriter, a print that needs to be framed, and an embroidered piece from a couple years ago. So much of my furniture is from ikea! 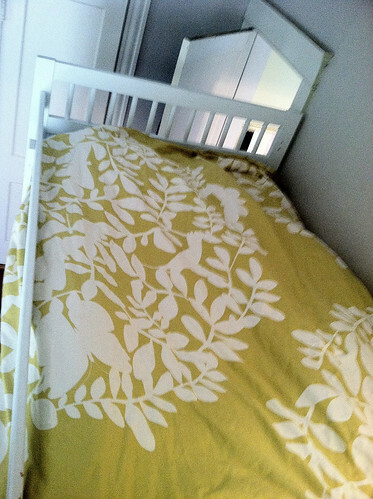 The loft bed frame is actually "vintage" ikea; bought it off craigslist and painted it white. 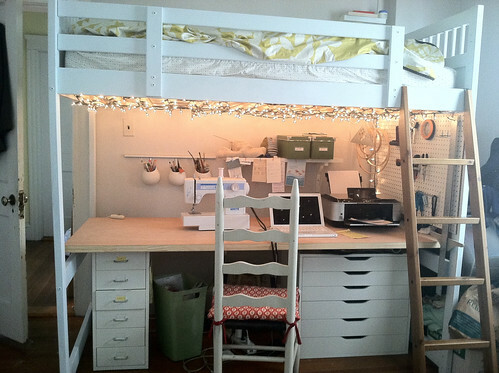 I attached a couple strings of white lights to the wooden slats on the underside of the bed that light up the desk space. 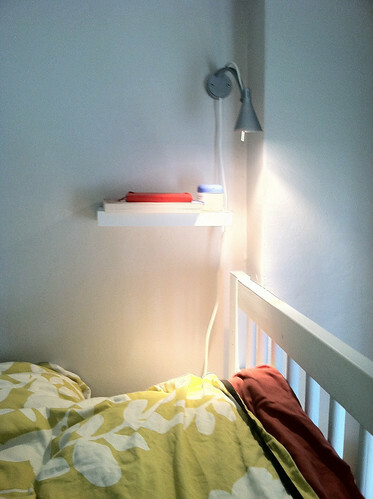 The lights are plugged in to a dimmer switch (also from ikea) that I can easily switch on and off. Before that I was crawling underneath the desk to unplug them, not a great situation. To the right of the bed and desk is about a foot and a half of space that works pretty conveniently as extra storage space since my closet is super tiny. It's thankfully pretty inconspicuous (except that in this picture it kind of looks like things are starting to pour out of it - I'll need to work on that!). The desk surface is a very heavy blank door that I bought at home depot. I used two ikea filing cabinets to prop up the desk; the one on the right is great for storing paper and projects. Unfortunately they're not the same height, so I ended up using some wooden blocks to level it out. I love my duvet cover! It's hard to see from this angle, but interspersed in the branches are birds and butterflies. 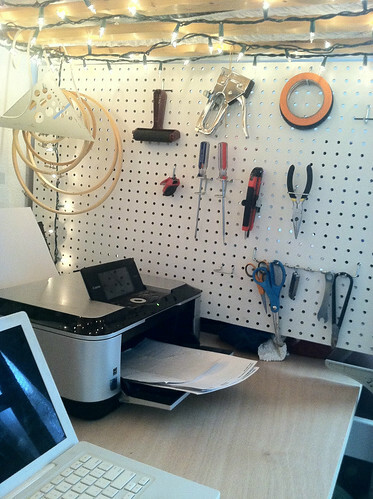 This pegboard keeps all my most-used tools in easy reach. 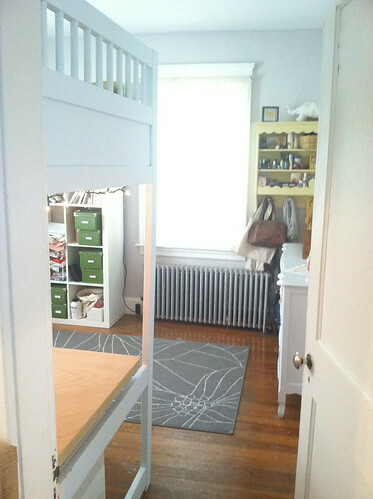 I fastened it to the bed frame and it does double-duty to block off that storage area. These two storage areas help keep my work surface free of clutter; the hanging ceramic cups keep my painting and drawing tools organized, and a shelf with a couple boxes keeps the rest of the mess off my desk. 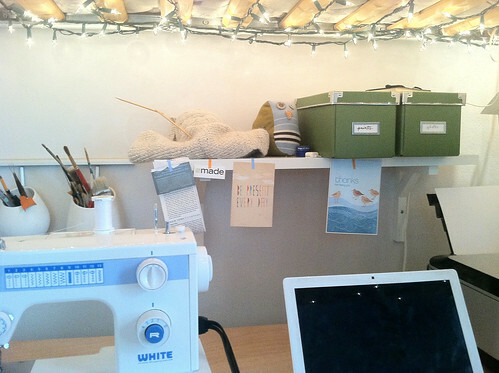 Hope you enjoyed my little studio tour!